What are the invisible forces at work, if any, that bring angels into our lives? Coincidence, serendipity, vulnerability, reputation, intentionality, or whatever it might be, how fortunate we are when we encounter people during our lives who simply have a desire to support and encourage. I’ve been reminded of this recently. Over the life of Oasis, we have been fortunate indeed. Whether it’s been individual or organisational clients who have continued to work with us beyond the commissioned work to address demanding questions, or individuals who recognise the deeper work we are committed to and want to support us in our endeavour. We have had the help of many people, from partners within the ‘big four’ wanting to support something beyond the usual, to business executives keen to nurture alternatives to what they’d experienced, to perhaps most importantly, seasoned practitioners and guides in the fields of OD, coaching, gestalt, creativity, systems thinking, healing and inner change, wellbeing, global responsibility and leadership. Earlier in the year I received a call from Leeds-based writer and creative artist, Peter Spafford, who has been commissioned by the Scott Creative Arts Foundation to capture aspects of the lives of Michael and Eileen Scott. This is to go some way to introduce them to people who may benefit from their Foundation but will never meet them. Michael and Eileen, who died relatively recently, were two of the people who have been Oasis encouragers, particularly close in our early years. They had an approach that was full of presence and clarity as to what might be needed. Their combination of creativity and business experience from their time with ICI was so insightful at a time we were grappling with how to be more commercially intentional without losing our essence in the late 80s and early 90s. Their help expanded to encompass supporting the directors’ group through tricky questions as we lived the pioneer phase in all its ecstasy and agony. Later we spent three years together exploring the creation of a living community, often hosted at their home in York – what a journey that was! Needless to say we decided not to live together, but to focus on the working community of Oasis. Talking to Peter about them has brought them back into my life more vividly, reconnecting me to both their writings and their paintings, many of which are beautifully exhibited at the Scott Gallery in Boroughbridge, curated by Sue Armstrong. I would recommend a visit to the website and also to the gallery. Peter’s thoughtful, gentle and nurturing style of interviewing has been a joy to experience and I hope our connection will continue. 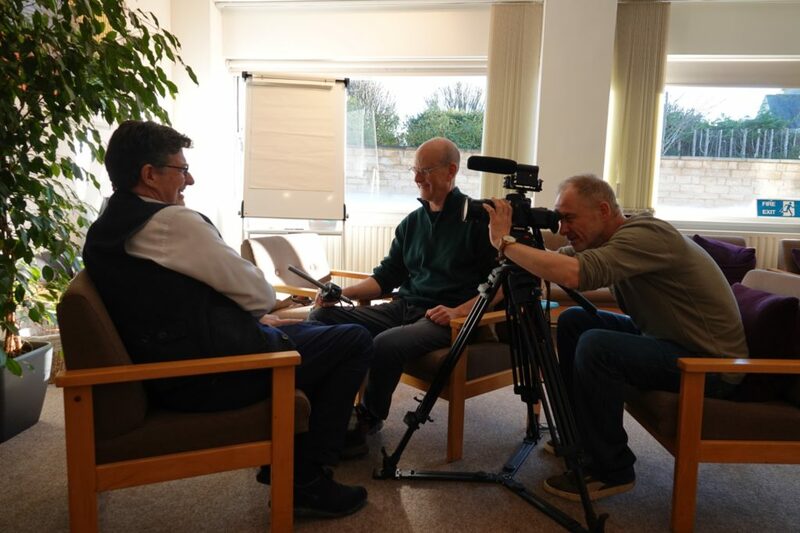 Last week the interviewing shifted from written transcript to filming – and I met another relational creative in Andy Wood, filmmaker and programmer at Leeds International Film Festival. It struck me, after spending time with them, that characteristics of their approach reminded me of aspects of Michael and Eileen: present, competent, positive, with a sense they could see more than they ‘let on’ at the time, and a deep passion for the intangible and creative. When I reflect on all the help I have received, I feel very grateful. It has left me looking back on my life and internally mapping my garden of encouragers – more like a small estate. I’d recommend the process to anyone – it somehow feels more positive than considering resolutions for 2019. It also leaves me wanting to be encouraging of others as I have been supported – perhaps that is a resolution. When the film is completed I’ll post a link, and hopefully more people will say hello to the legacy Foundation of Michael and Eileen Scott.